These prices reflect the overall project cost, please call us for more information on pricing for your project. 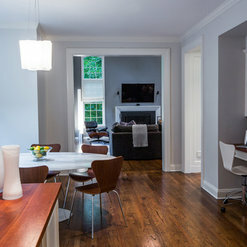 New York City's Preferred Architect - 3x Best of Houzz Winner! Hirshson Architecture + Design provides complete architecture and design services from project inception through final installation. We work with clients to identify the scope of work, review budgets, select general contractors, oversee building department requirements, and supervise construction. Projects range in size and complexity from small-scale additions, to new residential construction and luxury commercial spaces. Each incorporates a close attention to detail, material selection and methods of installation. The result is a bespoke design rooted in classical architecture, reflective of contemporary living, that improves with age. Founded in 2010 in New York City, the firm moved to its present location in Armonk, New York in 2015. Located in a retail storefront, the open space allows for the display of drawings, materials, and images while promoting the exchange of ideas between architects and clients. Scott Hirshson, AIA oversees the design of each project. Senior architectural staff manage the design documents and construction administration. Professional, great design aesthetic, hands-on from start to finish. A fabulous combination of architect and designer. Greatly improved not only the look, but the flow of my house. A pleasure to work with. Thank you! It was a pleasure creating your new kitchen and bar! My husband and I are first time homeowners and were nervous about starting a big project like renovating our master bathroom. 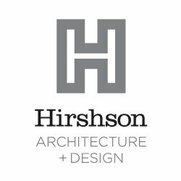 We were given a recommendation for Hirshson Architecture + Design from a trusted friend who works in the business. Scott and Liza helped us from start to finish with the project. 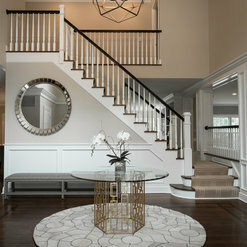 They assisted us with hiring contractors, checked on the project at all stages, and helped design the entire room, as well as buy and source the materials to make the room as beautiful as we hoped it could be. They worked hard to conceptualize the look we wanted. Their help and Knowledge was invaluable. We plan on using Hirshson Architecture + Design in the future in bigger expansion and renovation for our home. Thank you Dannielle! We look forward to working with your family again soon. Hello! We hired Scott after interviewing other esteemed architects in Westchester. We had very specific criteria for the project and he met, worked with and exceeded our high standards! First, he presented 4 ideas for plans. (We only asked for 1 but he kept going because he had more ideas to share - we were very impressed.) We chose a plan, modified it slightly, and then worked to hire a contractor. We hired Scott not only to do the plans, but to manage the permitting, the contractor relationship, and some of the construction. He and his team did a great job. I was very detail-oriented and I found Scott to match my enthusiasm for the details. He was easy to work with, inventive, open to ideas from the homeowner and the contractor, and would help us find cost-effective options when we needed it. We found him to have creative ideas, to be very organized, and to have high standards throughout! We would highly recommend Scott Hirshson. It was exciting working with you and your family on your renovation. We're thrilled with the architectural and functional improvements we achieved together. Scott redesigned my basement and turned it into a functional living space. He is very thoughtful, detail oriented and easy to work with . The end result was better than expected! Scott and his team are beyond professional and detailed oriented. They are creative and are able to come up with solutions that exceed expectations. We bought a 3BR in a landmarked co-op building from a family that had owned it for 40 years and had not renovated it since moving in. Making it work for our family was a substantial undertaking. We could not have done it without Scott. His command of detail, his commitment to the project, his patience with us, his savvy with the vendors, his toughness with the contractors, his willingness to keep coming up with good design ideas even after we'd shot down ones that were perfectly fine (but that we just didn't like) were all tremendous from the beginning to the end of a 10-month process. I have never heard of a home improvement like this being a stress-free experience, and Scott's wisdom and good sense provided an essential calming influence. We came in on time and on budget, without change orders, all very much thanks to him. We can't say enough good things. Thank you for the review. It was a pleasure working with your family, and I'm so pleased it was such a positive experience. 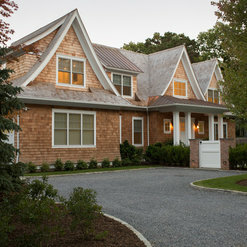 My husband and I hired Scott Hirshson of Hirshson Design Group after we decided to build a home in East Hampton. We’ve followed Scott’s work for years and always knew that we wanted to work with him. His taste, professionalism and wide-ranging knowledge came together to make our new home even better than we’d initially hoped. Working with Scott was a pleasure and we are thrilled with the result. Scott supervised and coordinated the entire project including design, construction, landscaping and interior design. He generated ideas and enthusiastically incorporated our ideas and preferences. Scott worked with vendors and us to select materials options for us to consider that were within our budget. Critically, Scott worked smoothly with the wide range of parties required to build our home. Scott takes meticulous notes of every meeting and the few times he couldn’t recall a detail, he could find it in his black notebook! Scott’s poise, professionalism and enthusiasm make him a distinctively talented architect. We have found ‘our’ architect and we will absolutely work with Scott and Hirshson Design Group when our next project arises. Thank you for including me in the process. It was a fantastic experience working with you and the design team in East Hampton. We have worked with Scott Hirshson of Hirshson Design Group for many years and the entire relationship has been fulfilling. We successfully completed two gut kitchen renovations and are working on a third. Scott is a true professional and ultimate team player. He intimately involves every "player" (us, the homeowner, etc.) in every decision along the way, vs. taking total control on his own. He is very talented in his profession and, although he always has a very definite vision of what he's trying to achieve, he is open to the suggestions of the rest of the "team" - after all, his ultimate goal is the satisfaction of the client, and the team overall. 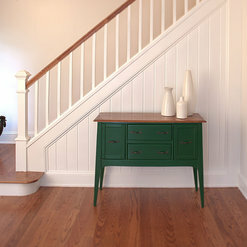 He works intimately with the homeowner explaining the entire process, why he made certain selections, etc. Scott is young and fresh, really up-to-date on the latest trends and industry offerings. He's very conscientious, ultimately "for" the client and with every job we've done together he has met the clients' expectations 100%. The spaces have been designed in conjunction with your team, and the Hirshson Design Group coordinated the installation. 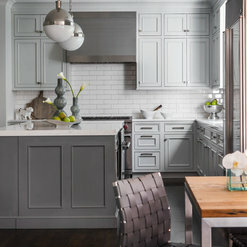 Both clients worked with custom finishes to transform their existing spaces. It's always a pleasure coordinating custom cabinets with you. Thank you for being a great part of my "team." We engaged Hirshson Design Group for the renovation of our third floor into a master bedroom suite. We were beyond satisfied with all aspects of the job. Our renovation was run smoothly and seamlessly and experienced none of the bumps that deter many from doing work in their homes. We were very pleased with Scott's skills as an architect and appreciated the meticulous way he looked at our space. From the blueprints to the construction phase, he brought a trained eye to the process. Furthermore, his guidance on hardware & lighting fixtures, tiles, millwork and paint was extremely valuable. We could not have realized our vision for our master bedroom suite without his vision. The results exceeded our expectations. Ultimately Scott is committed, efficient and very talented and will be an asset to any project he is engaged in. It was a pleasure working through the Master Suite with you. It's a terrific use of space in a beautiful home. We employed Hirshson Design Group to design and oversee an extensive renovation of a free-standing victorian-era home in Brooklyn, NY. The scope of work consisted of bringing a classically detailed structure up to today's standards. HDG designed a magnificent master suite complete with dressing room and spa-like bathroom with separate shower, soaking tub, toilet room and double vanity. The entry vestibule was realigned to extract the most usable area out of a double-wide living room. A period, leaded glass cabinet was then moved, preserved and repurposed on either side of a new fireplace that now sat at the room's newly-created focal point. Ceiling and base moldings throughout the home were either repaired, extended, or created to match where none previously existed. 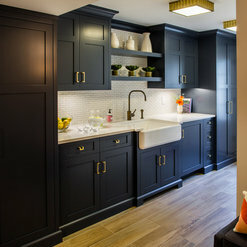 Over the course of the project HDG worked tirelessly to ensure that the existing victorian details we fell in love with were retained whilst overseeing the installation of modern systems and conveniences. Most importantly, Hirshson Design Group played an integral role as a tireless Project Manager / mediator between us and our contractor. I would recommend their services unequivocally. Thank you for the terrific overview of your period home. It was a pleasure working with your family to update the home for the next generation. We hired the Hirshson Design Group to oversee the customization of our home in Westchester, New York. 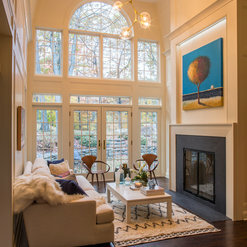 We worked with Scott to create a master plan for upgrades to the house including the addition of a new powder room, a custom library, new cabinets in the living and family rooms, a new lighting plan, and a new bay window in the kitchen. He explored options with us for each space, coordinated meetings with our interior design team, and kept track of our construction timeline. We felt confident that Scott understood the needs of our family, and he endeavored to ensure all the details fell into place. He consistently eased our nerves and broadened our minds on all the possibilities for our new home. We hired Scott Hirshson as principal architect for the gut renovation of our three-bedroom UWS co-op. From the outset, Scott was diligent, innovative, and caring. His plans were meticulous and creative, and he went to great lengths to explain the pros and cons of every option that he proposed. We were especially impressed with his ability to navigate the co-op and DoB labyrinth. Throughout the nine-month project, he was constantly focused and on top of every issue, and worked closely with the contractor to keep the project on time and on budget. He has a keen design sense, and expanded our horizons time and again. Commented: Where Did you get the print?Client sourced through Lilian August. It may also be available at Resource Decor. Commented: Painting name and artist?Artwork is titled “Neon Spacegirl.” Glad you like it! Commented: CountertopThank you for your inquiry. The counter and backsplash are marble - Arabescatto. The tiles are custom from Heath Ceramics. Commented: Gorgeous tileThank you for your question. It's a variety of Pacific White. Commented: LightsThe sconces are Visual Comfort's Graydon Collection.